Elina Svitolina, ranked No. 4, could win her first major at the 2018 French Open, which has no true favorite. Who is going to win the women’s singles title at the French Open? Maybe Simona Halep, who is ranked No. 1 but has yet to win a major. Or Garbiñe Muguruza, who won the title in 2016. Or 36-year-old Serena Williams, who had played just four singles matches since she won the Australian Open last year while eight weeks pregnant. (She won in the first round Tuesday.) Petra Kvitova, a two-time Wimbledon champion, looks good right now. So does Kiki Bertens, a 26-year-old who has never reached a Grand Slam final. Maria Sharapova is still around. Elina Svitolina, ranked No. 4, recently won the Italian Open and looks in top form. Or maybe a young and upcoming woman like Katerina Siniakova, age 22. Or better still, another player no one has heard anything about and isn’t expected to win under any circumstances. Williams’s absence is certainly a big part of that. But since 1990, the battles at the top of women’s tennis have become less predictable. In the 1980s, the best destroyed the rest. Martina Navratilova and Chris Evert ramped up their rivalry and dominated their competition before the remarkable Steffi Graf came along. 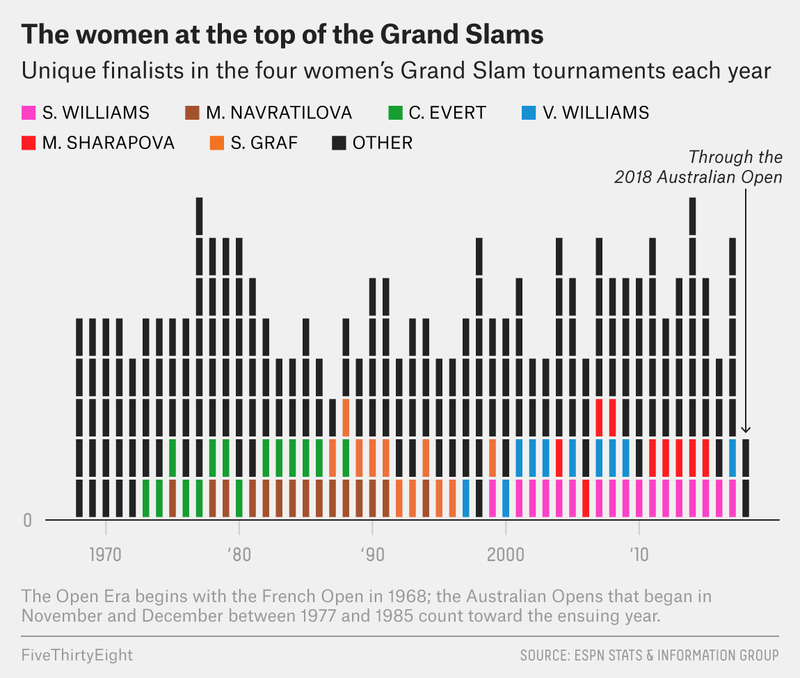 Other than Graf, only three players won their first Slam in the ’80s.3 Even more unusual: Only 11 women reached a Grand Slam final for the first time. Yet despite Serena’s talent, many other women have found ways to reach major finals and, often, win them. Australian Samantha Stosur made it to the French final in 2010 before beating Serena in the 2011 U.S. Open final. Williams looked like she might win all four majors in 2015, but she lost in the U.S. Open semifinals to Roberta Vinci, who had never reached a Grand Slam final before.4 Vinci’s opponent in that final, Flavia Pennetta, won her first — and last — major: She announced her retirement shortly after capturing the title. In this current stretch from 2010, seven women have now won their first major and have not yet won a second. Last year, Venus Williams was the only player who made more than one final (losing to her sister in Melbourne and to Muguruza at Wimbledon).5 And in 2014, as Serena was starting her run of Slams and Venus was on the comeback trail, the four Grand Slams had eight unique finalists. The question for the women: Will another player take over the game, like Serena Williams, Graf, Navratilova, Evert and others have done before? All signs point to no, because there’s too much talent from too many countries, and too much power, speed and stamina required to win a Slam. Still, it’s unpredictable. Just look at the men: In 2002, Pete Sampras won his 14th major title at the U.S. Open, the last tournament of his career. At the time, everyone thought that record would last for ages — until Federer and Nadal came along and both passed it, and both might add still more to their totals.6 In tennis, the only thing we know for sure is that anything can happen, especially when you least expect it. CORRECTION (May 30, 2018, 2:45 p.m.): A photo of Karolina Pliskova in an earlier version of this article was incorrectly identified as Elina Svitolina. This year, Ostapenko lost in the first round in Paris. Joining Ostapenko were Sloane Stephens, who won the U.S. Open in September, and Caroline Wozniacki, who won the Australian this year. Muguruza won last year’s Wimbledon after winning the French in 2016. Barbara Jordan, Hana Mandlikova and Arantxa Sanchez Vicario. Vinci, an Italian, retired from tennis in Rome this May. Venus lost this week in the first round of the French Open. Federer has 20 Slam titles, while Nadal has 16.